Handshake between the heads of the two respective delegations to the Redeployment Coordination Committee meeting in Hudaydah City, Yemen. 28 December 2018. Yemen’s warring parties have begun the process this week of implementing a comprehensive ceasefire agreement across the key rebel-held port city of Hudaydah, raising hopes that groundbreaking consultations convened by the UN in Sweden can lead to a lasting peace through further talks next year. The UN-brokered body made up of both Government and Houthi opposition representatives is known officially as the Redeployment Coordination Committee (RCC), chaired by retired Dutch General, Patrick Cammaert, with the support of UN personnel. The three-day meeting of the RCC followed on from the formal start of the ceasefire on 25 December. On Wednesday, both Houthi rebels and Government coalition personnel, worked to clear minefields to create a safe passage across a frontline for Government representatives to attend the meeting on rebel-controlled territory, during which General Cammaert commended the parties for their demonstration of goodwill to implement the Stockholm agreement. The first phase of putting the agreement into action is based on three priority areas: maintaining the ceasfire, confidence-building measures to deliver humanitarian assistance, and redeployment of fighters. Both parties have acknowledged this as an historic moment, and each have reiterated their commitment to implementing the Stockholm ceasefire, said the UN on Thursday. The parties are set to present detailed plans for full redeployment to Mr. Cammaert in the next committee meeting, programed for 1 January in Hudaydah. In the meantime, each have agreed to begin opening humanitarian corridors as part of confidence-building measures, starting with the key coastal road between rebel-held capital Sana’a, and Hudaydah. More routes are scheduled to be cleared, and a humanitarian convoy is scheduled to move from the port city along the Hudaydah-Sana’a road on Saturday. Fighting in and around Hudaydah for control of the key port intensified in recent months, which has severely narrowed the flow of essential resources and lifesaving aid, and exacerbated the threat of famine. The Yemen war intensified in early 2015 when a Saudi-led coalition joined the Government fight against Houthi rebels, instituting an aerial bombing campaign. An added consequence unleashed by the conflict has been the lack of pay for civil servants in rebel-held Hudaydah, which the Yemeni government has agreed to pay, backdated to the beginning of this month. President Abdrabbuh Mansur Hadi announced the decision on Thursday, marking a shift after more than two years during which the government was unable to pay salaries, according to news reports, causing the Yemeni riyal to fall heavily against the US dollar, and leaving many citizens unable to afford basic necessities like food and water. 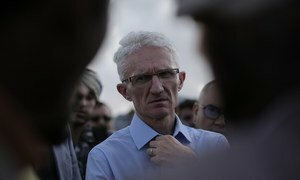 Conditions in Yemen have deteriorated alarmingly, and the country is on the “brink of a major catastrophe” said Mark Lowcock – Under-Secretary-General for Humanitarian Affairs and Emergency Relief Coordinator – on returning from his mission to Yemen on Saturday. 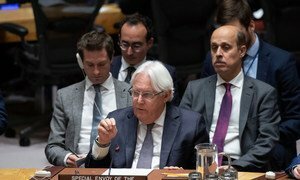 Addressing the UN Security Council on Friday, Martin Griffiths, Special Envoy of the Secretary-General for Yemen, said that although conflict continues to rage, he welcomed recent reports of reduced violence in the country.